We are fire and flood restoration specialists in and around Rhyl, Prestatyn, Colwyn Bay and surrounding areas. Welcome to MMS Building Contractor Network - the Nations Local Flood and Fire Restoration Company. We have teams of expert damage repair building specialists situated all across the UK, Our aim is to a complete and comprehensive property repair service to those who have been unfortunate enough to have endured a flood, fire, storm or even impact damage in their property. One thing we believe in is reaction time. It is vital and imperative to preventing any further damage to your property, this is why we will appoint a specialist restoration team on site within 4 hours of your aproval of our services. At MMS Building Contractor Network we understand that strain when your home or business is damages by fire or flood. The strains to your life can be terrible and you can often be lett feeling overwhelmed. As restoration experts we aim to be as efficient as possible in taking some of the burden off you by dealing with the whole process from start to finish in minimal time possible whilst keeping with our own personal high standards as well as your own. MMS know just how competitive this industry is. This is why we have decided to offer an extra service to ensure you benefit fully through the restoration process. We have recently welcomed a new and exciting working relationship with one of the UK’s leading independent loss adjusting companies. We can even recommend a company who offer a free loss adjusting service ensuring you recieve all you should be entitled to from your insurance company (conditions apply). 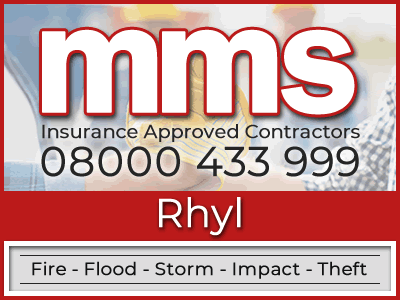 The danger that is associated with flood damage is one that needs to be treated with complete professionalism and by the most experienced of builders, MMS believe we can offer exactly that. With an expert team of highly experienced and trained flood and water damage property repair specialists, we can be on site in Rhyl within hours of you agreeing to use our services. This is one of many advantages for using MMS Building Contractor Network. Depending on how long the water has been standing or where the water originated from are just some of the many factors a flood restoration expert needs to consider when dealing with this type of damage. What most people do not appreciate is that standing water is a breeding ground for mould and bacteria. This can be harmful to your and your family and you may need to consider vacating your premises. If this is covered within your insurance policy we can even arrange alternative accommodation whilst repair work is completed. By using our specialist detection equipment such as infra-red thermal imaging, we are able to determine which areas of your property still contain water. This is vital as we will be able to find out the exact areas of your property that have been compromised. This is key to preventing any further damage occurring at a later date as repair work that has been completed may be undone as a result of damage not initially being identified. If you would like a more in depth explination regarding our flood restoration services feel free toclick the link below or alternatively call our 24 hour nationwide helpline on 08000 433 999. Our friendly and helpful staff will be able to accommodate all of your enquiries. Through restoring properties that have been devastated by the effects of a fire, MMS Building Contractor Network have established that there is always one common denominator. Every property needs the upmost care and attention, therefor we aim to treat your property with exactly that. Fire damage is painstakingly difficult to restore as there are numerous considerations to take into account such as, smoke damage, water damage from the fire crew, internal wiring and many factors. You can rest assure that our expert teams of building repair experts have encountered many of these situations they know exactly what is expected of them to get the job done. After the initial contact from you we canl assign you with one specific liaison personnel to talk you through your options and next steps, once we have determined the best way to proceed we can appoint a local MMS Contractor to your address to secure your property. MMS are a fire and flood restoration company who will always go the extra mile for you. We found that many of our customers had to deal with their insurers as well. It can be very frustrating having to negotiate with an insurance company because many may try to cut costs in order to maintain profit margins. You may be put under pressure to accept a settlement which does not cover the amount it will cost for all repairs to be completed to a good standard. You would then be left to cover the difference in cost. MMS will always offer you some sort of support when dealing with your insurer. We can offer free fire and flood insurance claim help. we can also put you in touch with a reputable claims management company who in most cases can offer a free loss adjusting service. This can be particularly beneficial because they may have a better idea of the real costs in restoring you property back to its previous condition, rather than a loss adjuster that has been employed by your insurer. They can then negotiate to ensure you receive the full entitlement required. Has your insurer asked you to obtain a builders quote? We are an insurance approved building company whom possess extensive experience of restoring properties that have been affected by fire, flood, escape of water, impact or theft. Contact MSS today on 08000 433 999 to receive a building repair estimate from our insurance approved builders. If you prefer, please feel free to fill in our building quote form with a bit of information and we will get back to you as soon as we can. As well as our specialist tradesmen we currently have team of professional liaison staff on hand 24 hours a day 7 days a week if you should have and questions or queries the team will keep you informed of every aspect of the ongoing works as well as any insurance matters that may arise.